I lectured today at the Indiana Law Survey for Indiana lawyers sponsored by the Indiana Court of Appeals. 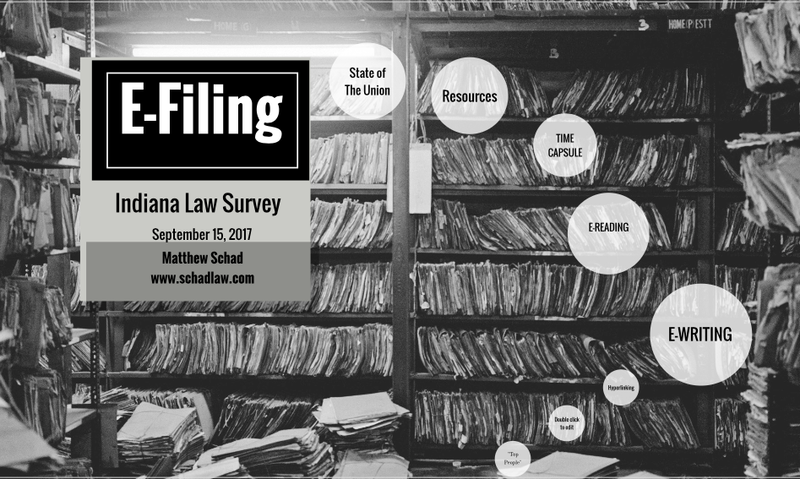 The law survey is a continuing legal education program with a large audience of lawyers from all different practice fields across the state. It was held at the Indianapolis Convention Center. Most of time I get asked to lecture it's about some technology topic. Back in the day - when I first started getting asked to lecture - I would talk about some pretty geek oriented topics like networks and programs. As the years passed, I become much less interested in the details of technology and more interested in how to use it to inform, communicate, and persuade. I think it's a natural outgrowth of my trial practice. So, when a program asked me present on technology, what they are really going to get is about 10% technology, 30% psychology, 20% neuroscience, 30% creative stuff, and a remainder of whatever random topic interests me. My job is to weave them all together in a way that gets people thinking in new ways. The topic of the presentation was E-filing. Courts have gone to filing documents electronically rather than in paper form, and a lot of lawyers have struggled with it. I spoke mainly on how to apply typographic and design principles to our documents that take advantage of the fact that the reader will see them on a screen rather than on paper. The presentation combined communication, the neuroscience of e-reading, how the brain maps and processes paper documents, and the aesthetics of good looking written material. Daily, 153 people die from a traumatic brain injury (TBI) in the United States. Cameron Fathauer is a former intern at Schad & Schad. He has a particular interest and expertise in traumatic brain injury. He's currently in college and looking forward to attending law school. TBI is also the leading cause of disability in the USA. The rate of risk for having a TBI is increasing every year. It is, therefore, likely you have a TBI or you know someone who currently has one. A recovery from a TBI and the resiliency to prevent a TBI are created best through a nutritious diet. This vague statement from a study on military Nutrition and Brain Injury poses a personal question for all of us—How nutritious am I? If our answer is a negative, ‘not very nutritious, instead of a positive, ‘very nutritious’ then we are not rightfully prepared for any sickness, let alone a traumatic brain injury. Based on my own experience in recovering from a severe traumatic brain injury, here is one of my favorite foods to eat for optimizing my TBI recovery. I recommend fish, or anything that will give you Omega 3 fatty acids (i.e. fish oil supplements). Not only is fish delicious, fish is key for optimizing a TBI recovery, providing TBI resiliency, and maintaining a healthy life in general. I think it might be fair to classify fish as the king of all foods. The amount of nutrients and benefits one can derive from eating fish are astronomical. Rich in Omega-3 fatty acids (Docosahexenoic acid, DOH), fish provides many cognitive benefits that aid in a TBI recovery and provide better TBI resiliency. Omega-3s reduce the risk of cognitive decline by aiding cognitive enhancement. As a person ages, their brain naturally deteriorates as death approaches. Of course, the youthfulness of a TBI patient plays a major role in one’s recovery; however, there comes a point when brain growth becomes brain decline no matter what. One disease of cognitive decline is Alzheimer’s disease. Alzheimer’s disease can happen to the best of us (i.e. 40th U.S. president Ronald Reagan), but Alzheimer’s disease has an increased risk in the traumatically brain injured person. Thankfully, however, there are ways to help prevent Alzheimer’s and natural cognitive decline through certain nutrients like Omega-3s. In this study, the benefits of fish have been linked to the prevention of Alzheimer’s disease and overall cognitive decline. This is in part due to the fact that fish increases grey matter in the brain. Gray matter stores information for memory storage and retrieval. People who eat fish weekly are found to have more grey matter in their brains than non-fish-eaters. Omega-3s increase positive neural activity in the brain. A lack of the nutrients provided by fish reduces the amount of positive neurons in a traumatically brain injured person. This was shown in a study from the United States Defense Medical Research Program in 2014. Here is a photograph portraying their results from studying traumatically brain injured mice lacking Omegas (‘Deficient TBI’) contrasted with injured mice sufficient in Omegas (‘Adequate TBI’). According to the study’s findings, a TBI mouse having a sufficient amount of Omega 3 fatty acids has more active neurons than a TBI mouse lacking Omega 3s. However, the amount of impaired neurons depends on the level of severity from a TBI. If the TBI is minor, the amount of neural damage will be little. But if the TBI is severe, or severe diffuse axonal, then the axons in the brain are shaken or ripped apart and now require new neural pathways and replenishment. Nonetheless, Omega 3 fatty acids protect and promote neural activity for a TBI patient. Omega-3s act as an Anti-depressant. Nearly half of all traumatic brain injured persons suffer from depression. When the brain is damaged, it is hard to be happy. So, it follows then that a brain injured person likely lacks happiness. Of course, this is also depending on the severity of his or her injuries and the placement of said injuries. But according to this study, Omega-3s derived from fish are linked to a happy life. The Omega-3s provided by fish act as an anti-depressant because they have been shown to increase serotonin and dopamine levels in person’s brain. My high school psychology teacher would often take the class on a ‘Serotonin Walk’ to increase the moods of her students. Not saying it was sufficient for increasing every student’s mood, the philosophy behind her thinking was correct: if one increases serotonin, then one increases happiness. The ability to increase serotonin and dopamine levels is the key component for common anti-depressants like Prozac or Alexa. You can either take these drugs to lift your mood, or eat some fish, or do both. Omega-3s provide resiliency to TBI. Not only does fish intake reduce the risk of cardiovascular failure and other diseases, fish intake provides a cushion of resiliency to a traumatic brain injury. Although no one wants to suffer a TBI, the Boy Scout Motto, ‘Be Prepared’, fits accordingly here. Factoring in all of the previous listed benefits of fish, it follows that fish intake or Omega-3 fatty acids help lower the effects of a TBI. Without the Omega-3 fatty acids from fish, a TBI recovery is diminished because Omega-3s prevent cognitive decline, help repair neural damage, and act as an anti-depressant, which creates a better resiliency to guard against the drastic effects of a TBI. 1. Take daily fish oil supplements. 2. Start ordering salmon when you have the option (or tilapia). 3. Watch out for fried fish; it kind of defeats the purpose. Faul M, Xu L, Wald MM, Coronado VG (2010) Traumatic Brain Injury in the United States: emergency department visits, hospitalizations and deaths 2002–2006 Atlanta (GA): Centers for Disease Control and Prevention, National Center for Injury Prevention and Control. 7 p.
 Yan Q-S, Reith MEA, Jobe PC, Dailey JW. Dizocilpine (MK-801) increases not only dopamine but also serotonin and norepinephrine transmissions in the nucleus accumbens as measured by microdialysis in freely moving rats. Brain Research. 1997;765(1):149–158. I’m in a trial as I write this. A young man with a lot of health problems had an infection that could have been cured with proper treatment. Unfortunately, he had lost his job a few months before, and his health insurance along with it. He wanted to work, but jobs were scarce in his small town. When he got sick, everything was harder without insurance. He could not see who he needed to see; could not get into the hospital on time; could not get good care. Yes, he was eventually seen and admitted. But when you’re critical, hours make the difference between life and death. Those hours caused this young man his life and left his wife a widow. Our health insurance system is a mess. All of us should want every single U.S. citizen to have full access to free, competent health care, regardless of our political affiliations. We are the richest, strongest, most advanced nation in the world. Every other advanced nation makes sure that its people don’t suffer or die because they can’t see a doctor. Matt Schad teaches half day trial advocacy seminar. On June 2 Matt was a featured speaker at the Indiana State Bar Association Solo/Small Firm convention. He lectured on four individual topics, including “Contemporary Theories in Trial Practice”, “Putting the Theories to Work”, “Visual Storytelling” and “Unconventional Trial Prep”. Matt is a frequently requested speaker on the attorney lecture circuit. The powerpoint presentation from Matt Schad's lecture to the Indiana State Bar Association on modern trial theories and how to use them. Given on June 2, 2017. If you would like for Matt to speak to your group, or you're interested in our co-counsel/trial consulting services, give him a call at 812-945-4555. On June 8th we were part of a successful trial of a medical malpractice case in Clark County. The case was against a family practice doctor who failed to diagnosis fatal sepsis and sent a patient back home. The case was difficult becauseother hospitals after the misdiagnosis also made mistakes that contributed to the young man’s death. Matt was co-counsel and trial consultant with Bo Bolus and Nick Naiser of the Bolus Law Firm. They had worked diligently on the case for seven years prior to the trial. Our client, Kayla Hill; Bo Bolus; Nick Naiser; Matt Schad. Clark Circuit 4, Hill v. Woodiel. Winning a medical malpractice case in this state is like pushing a rock uphill. Indiana has more protections for doctors than any other state. They have almost unlimited money to defend cases and hire experts. Hardest of all, almost all jurors like doctors and give them the benefit of the doubt. We are proud of the work we did on this case. Bo and Nick are amazing trial lawyers who pursued the case with skill, diligence, and tenacity. Over the last few years Matt has started to do more trial consulting with other attorneys. He ran focus groups for this case, helped formulate trial strategy, argued objections, conducted jury questioning, and handled rebuttal closing. It’s good to be part of a well oiled team. Walking into Schad & Schad for my internship for the first time, I wasn't too sure what to expect. I asked Elias to share some of his thoughts about his internship with me. Although a future law student, I had little experience and had never before stepped foot in a law firm. Preconceived notions creeping into my head caused me to picture a drab office with stuffy attorneys and staff, with not much more to look at than tan walls and uninspired generic artwork. Needless to say, I found Schad & Schad to be nothing like the presuppositions floating around in my head. While the actual building was surprisingly modern and the décor was inspired, the people within the building were the big difference. Far from stuffy, everyone I interacted with was extremely pleasant and welcoming, making me feel like an asset rather than a burden. Starting with the receptionist Shelly greeting me at the door every morning, each member of the Schad & Schad team helped make my internship experience very pleasant. My internship with Schad & Schad wasn't most beneficial to me because it taught me the law. I have the next three years of my life to be provided with that kind of education. What was beneficial is that my experience gave me real life insight into a small corner of law where I was able to learn how lawyers, clients, and other players in the judicial process conduct themselves. I found all the legal research and case reading interesting. However I found it more interesting studying things such as how each lawyer or judge approached their work and also everyone’s attitudes about working in the legal field in general. This type of observation allowed me a better picture of what might be in store for me in my future career and also gave me a better idea of how I should prepare to achieve my goals. Overall, I found my internship at Schad & Schad to be a great experience. I wish I had more time to invest in the internship, but the time I did get to spend with the office was quite valuable. I am happy to say after my internship’s completion, I am even more excited to attend the UofL Brandeis School of Law this fall than when I started! I heard someone say once that there are two kinds of lawyers: those who did most of their work at desk, and those that did most of their work on their feet. I prefer the latter, but appeals are a fact of life and a good appeal is the difference between winning and losing. We aren’t just trial lawyers here at Schad & Schad, PC. We represent clients at every stage of the legal process, including at the appellate level. Over the past 2+ years we have earned 2 significant victories for our clients in published decisions. Our firm advocates for our clients at every level and we currently have 2 cases on appeal in Indiana. When we win a big verdict, the defense almost always appeal. Good work on appeals is vital to helping our clients. In Heritage Operating, L.P. d/b/a Empire Gas v. Mauck and Thomas, our firm represented 2 victims of a devastating gas explosion. Our clients occupied a rental property that contained a half full propane gas tank owned by Empire Gas. The tank had been left there by a prior tenant. When our clients moved onto the property, there was noted confusion as to who owned the gas and whether our clients could use the gas for heating purposes. When our clients utilized the gas, escaped gas later caused a massive explosion that left our clients with severe and permanent injuries. We sought recovery from both the owner of the property and the gas company. The gas company attempted to have the case dismissed at the trial court level, which was the basis for this appeal. Ultimately, as to the central issue of the case, the Indiana Court of Appeals stated that a gas company owes the public a general duty of reasonable care to persons who might be injured by the propane. This matter later resolved out of court. In Nolan v. Clarksville Police Department and Town of Clarksville, we sought recovery for a young woman who was injured while serving as a volunteer in a police training exercise. This was a difficult case and was initially dismissed at the trial court level on technical pre-suit notice issues regarding injuries caused by governmental entities. However, we vigorously argued on behalf of our client in the Indiana Court of Appeals, which ultimately reversed the trial court’s dismissal. While both parties sought further review by the Indiana Supreme Court, the case resolved out of court and the appeal was dismissed. In Harrison County Sheriff’s Department v. Leandra Ayers, Personal Representative of the Estate of Christine Britton, Deceased, our client was the surviving daughter of a woman who lost her life in a tragic set of circumstances involving her husband. The central issue in the case was whether the husband of the deceased woman, who was a deputy sheriff for the Harrison County Sheriff’s Department, was furthering his employer’s interests at the time of his wife’s death. Although a jury rendered a verdict for our client in the amount of $1.2 million, the Indiana Court of Appeals overturned that result. Currently, the matter is awaiting final adjudication before the Indiana Supreme Court. At Schad & Schad, we are proud of the fact that we successfully handle cases from pre-suit negotiations all the way to arguing appeals in the Indiana appellate court system. We are prepared to advocate for our clients every step of the way. Congratulations to Elias Kang-Bartlett! Elias just finished an internship with us before he’s off to travel Japan then go on to University of Louisville Law School this fall. He received a full academic scholarship, a rare thing indeed this world of hyper-competitive law student admissions. He’s exceptionally bright and gifted. I speak for all of us when I saw that we fully expect him to do great things. Don't let the smile fool you. This kid is a stone cold killer. Don is retiring at the end of the month. We're going to miss him. He's a "lawyer's lawyer". Honest, straightforward, and unafraid of any odds. He's been fighting for injured people for over 50 years. Please stop by our reception to help us honor his career. Matt Schad and co-counsel Rob McCrae won a $330,000 jury verdict in Bloomington on November 10th. It was a difficult case and State Farm had refused to make ANY offers to settle. Our client was a wonderful older gentleman who was rear ended with very little property damage. Like many of our older clients, he degenerative disk disease in his spine before the collision, and had some prior problems in his back as well. State Farm argued that all of his conditions were pre-existing, and that the impact of the crash was so minor it could not have hurt him. The company hired a neurosurgeon from Louisville and a biomechanics engineer from Atlanta to support their theory. We called our client’s treating doctor and his wife as witnesses. After a hard two days right after a bitterly contested election, the Monroe County jury found in our favor and returned a verdict of $330,000. We were thrilled to have been asked to participate in the case by McCrae and McCrae, an outstanding Bloomington law firm. Matt frequently gets asked to partner up with other attorneys as part of their trial team.